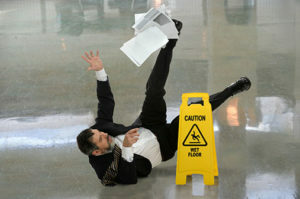 Have you been injured in a Slip or Fall accident here in New Jersey? Birkhold & Maider Attorneys at Law are experts in Slip & Fall Claims and can help you get the compensation you deserve! Slip and Fall Accidents are a common cause of personal injury suits and have many causes related to the negligence of other parties including, but not limited to, uneven pavement/sidewalks, poor lighting, wet or slippery interior floors, damaged flooring, obstructions or debris on floors, sidewalks, or other walkways, poorly placed or absent hazard warning signs, wet or icy exterior walkways, lack of handrails on staircases, among other potential causes. Slip and fall accidents may result in injuries including: sprains and strains, broken bones, torn ligaments and tendons (sometimes requiring surgical intervention), spinal injuries (such as herniated or bulging discs), shoulder injuries (such as rotator cuff tears) and head injuries (which, if severe enough, may cause traumatic brain injury with resulting neurologic and other issues). If the trauma is severe enough, it might even result in death. Should I Reach Out To An Essex County Slip and Fall Lawyer? When injured in a slip and fall accident, you may be immediately worried about the cost of medical treatment. If you have health insurance, this will not be an issue. However, if you are one of the millions of Americans without health insurance, a slip and fall lawyer at Birkhold & Maider can help make sure you get the treatment you need without paying any out of pocket medical costs until the conclusion of your case. We work alongside your doctors to ensure they give you the same care you would receive if you had health insurance. Injuries sustained at the workplace are another area of our firm’s core personal injury competencies: We have provided legal counsel and representation for workers’ compensation cases in Essex County workers compensation court, Passaic County workers compensation court, Bergen County workers compensation court, Union County workers compensation court, Middlesex workers compensation court, and elsewhere in the state of New Jersey. An Essex County Slip and Fall Accident Lawyer at Birkhold & Maider, LLC, serves injured parties and their families in many jurisdictions across New Jersey. We serve clients in many townships and jurisdictions across New Jersey including Newark, Belleville, Paterson, Clifton, Passaic, East Orange, Bloomfield, Nutley, and other townships in Essex, Passaic, Bergen, Union, and Middlesex Counties, and beyond. Contact us for more information on the areas we serve. Knowledgeable, aggressive representation can make the difference between gaining an ability to move on with your life or carrying the effects of an unsuccessful case or unsatisfying result with you. To determine the full value of your claim, we will work with outside experts to prepare as comprehensive a case as possible. Your focus should be on your health; we will take care of the rest. Contact the Attorneys at Birkhold & Maider in Bergen County Today.